Insulin reduces blood glucose levels. There are two adrenal glands, one situated on the upper pole of each kidney enclosed within the renal fascia. They are about 4 cm long and 3 cm thick. The arterial blood supply to the glands is by branches from the abdominal aorta and renal arteries. The venous return is by suprarenal veins. The right gland drains into the inferior vena cava and the left into the left renal vein. The glands are composed of two parts which have different structures and functions. The outer part is the cortex and the inner part the medulla. The adrenal cortex is essential to life but the medulla is not. The adrenal glands are comprised of two parts--the cortex and medulla--that produce hormones (chemicals messengers that regulate body functions). The medulla, or inner part of the adrenal glands, produces the hormones norepinephrine and epinephrine, which regulate the "fight or flight" response in the body, the body's reaction to stressful events. The cortex, the outer portion of the adrenal glands, produces several hormones that affect blood pressure and blood sugar levels, growth, as well as some sexual characteristics. The liver is a large, meaty organ that sits on the right side of the belly (see figure a). Weighing about 3 pounds, the liver is reddish-brown in color and feels rubbery to the touch. Normally you can't feel the liver, because it's protected by the rib cage. The liver has two large sections, called the right and the left lobes. The gallbladder sits under the liver, along with parts of the pancreas and intestines. The liver and these organs work together to digest, absorb, and process food. The liver's main job is to filter the blood coming from the digestive tract, before passing it to the rest of the body. The liver also detoxifies chemicals and metabolizes drugs. As it does so, the liver secretes bile that ends up back in the intestines. The liver also makes proteins important for blood clotting and other functions. The gallbladder is a small pouch that sits just under the liver (fig a). The gallbladder stores bile produced by the liver. After meals, the gallbladder is empty and flat, like a deflated balloon. Before a meal, the gallbladder may be full of bile and about the size of a small pear. In response to signals, the gallbladder squeezes stored bile into the small intestine through a series of tubes called ducts. 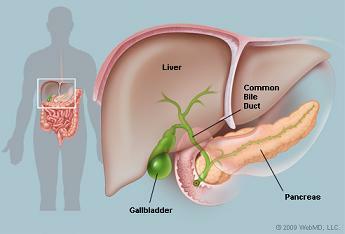 Bile helps digest fats, but the gallbladder itself is not essential. Removing the gallbladder in an otherwise healthy individual typically causes no observable problems with health or digestion yet there may be a small risk of diarrhea and fat malabsorption. 2) What is the function of liver? 4. Ross and Wilson, Anatomy and physiology in health and illness by Anne Waugh and Allison Grant.